I was raised in the city of Thunder Bay at the Northern point of lake Superior. I grew up in a family where music and crafting were a constant. It was their creative influences that gave me the inspiration to pursue Glassblowing as a career path. At age 19 I moved to Oakville, just outside of Toronto, and majored in Glassblowing at Sheridan College’s three year Crafts and Design program. In the summer of 2004, I founded Red Om Glass. With a small torchworking set up in tow, I traveled extensively throughout Eastern Ontario, to craft shows and exhibiting spaces, selling my handmade jewelry. This venture employed me for several years in addition to my glassblowing time spent working and teaching at Merrickville’s Kiss My Glass. 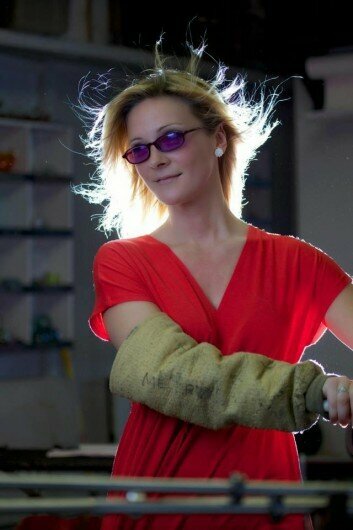 In 2012 I partnered with, now retired, Bronwen McKnight and founded Flo Glassblowing in the city of Ottawa. The studio was named in honour of my late grandmother, Florence Jewitt and it serves as a creative space of play, learning, and artistic development for the community. After 12 years working in the field of glassblowing I have felt blessed to stay true to my heart’s desire and create for a living. Teaching this ancient art form has been the most rewarding part of my job. I will never tire of seeing fresh eyes light up at the site of such an illusive glowing substance.